Mongolia offers one of the last wildernesses in Asia and in the World. It has got plenty of waters with often rich marine life. One of the largest living freshwater fish on earth, the Taimen (Hucho Taimen) lives within the waters of various rivers and lakes. The Big Taimen is a particularly ferocious fish which can often obtain weights of 50 kilos or more. Our major species are: Salmon (Taimen), Trout, Pike, Grayling, Sig, River Perch, Siberian Umber, Roach, Ide, Bull Ide, Golden Carp, Amur Catfish and Burbot. Fishing in Mongolia is a wonderful experience. We have over 4000 rivers and more than 30 lakes - all totally unspoilt and unpolluted, and a fabulous place to catch a wide variety of fish. Although many of them are similar varieties to those found in European rivers, Mongolian fish are much bigger and more abundant – much more satisfying for a day at the river! The Taimen, the largest fish in the salmon family, is a real challenge to catch – try your luck on this tour! The average taimen is around 33 inches and weighs roughly 10 pounds, however, there will be multiple chances every day to try catching fish over 50 inches. Siberian White Fish, Siberian Grayling, Lenok, Umber, Baikal, Omul and River Perch are among the other varieties you will catch among the spectacular scenery of Mongolia 's exotic nature. Fly fisherman's real treasure lies in this unbelievable clear, easy wading waters with incredible, nearly untouched wilderness with amazing mountains and vast valleys around the camps. During August and September, the weather is generally sunny, but please keep in mind that the camp elevation is 4.000 feet and more, so better prepared for potentially cold nights. To ensure an abundance of good fishing waters and ultimate satisfaction to each of our guests and to remain flexible, we will keep our programs small. 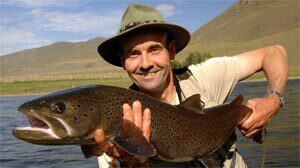 Fish Mongolia are outfitters exceptional fly-fishing float trips, and camps in Mongolia. The fly-fishing is primarily for Taimen, Lenok Trout and Grayling. 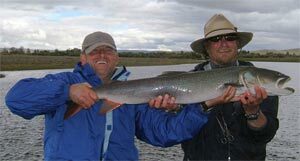 Taimen are renowned for their aggressive surface strikes on mouse and squirrel flies and can grow to the largest size of any fish in the salmon family; put simply they are a giant pre-historic trout. You will stay at a fishing camp on the river Onon in the eastern region of Mongolia. The fishing area in the campground extends about 10-15 km along the river and the surrounding area is sparsely populated, with the exception of a few nomadic dwellings. The peaceful environment offers a perfect opportunity to escape the tension of the city and just relax and unwind. The fishing season lasts from about August 20th till October 20th. During this period, there is no rain and water is usually transparent and at a low level, enabling the best catch. June 15th to July 5th is also possible as the water level is normal, however there is occasional rain.